A client was building an exceptional shore home in Ocean City, New Jersey. Their intent was to have a shore house large enough to accommodate the entire family, and also be appealing for other New Jersey Shore vacationers to rent for their getaway. There was a prominent exterior staircase on the front of the shore home that allowed access to both housing units. The client wanted a special staircase and in the process the builder, architect and client reviewed many stair ideas. Modern, traditional and monumental stairs were pored over in search of that design that expressed the client’s vision. A few stair designs were actually selected and mocked up in place, but they just did not quite compliment the caliber of the architecture of the house. The Stair design ultimately selected had the feel of a modern sculptural stair. Curved, floating treads on a single round member, suspended from both top and bottom give those stairs awesome wow factor. And especially given the fact that one stair is directly above the other! There were significant engineering challenges the main structural members had to structural enough to support the stair and the live load. Yet the structural member had to be curved tightly, very tight, to a 4 ft. pan view radius. So, we utilized a heavier gauge pipe than normal. The curved railings were supposed to have a modern look, so all railings were supposed to have horizontal. These were designed to go through the railing post and welded with minimal weld visible. For this we utilized special TIG welding process. And because of the proximity to the Harsh elements to the New Jersey Shore, corrosion was a major concern. So, the entire steel stair structure was hot dip galvanized, brush blasted and then powder-coated with a modern silver sheen. 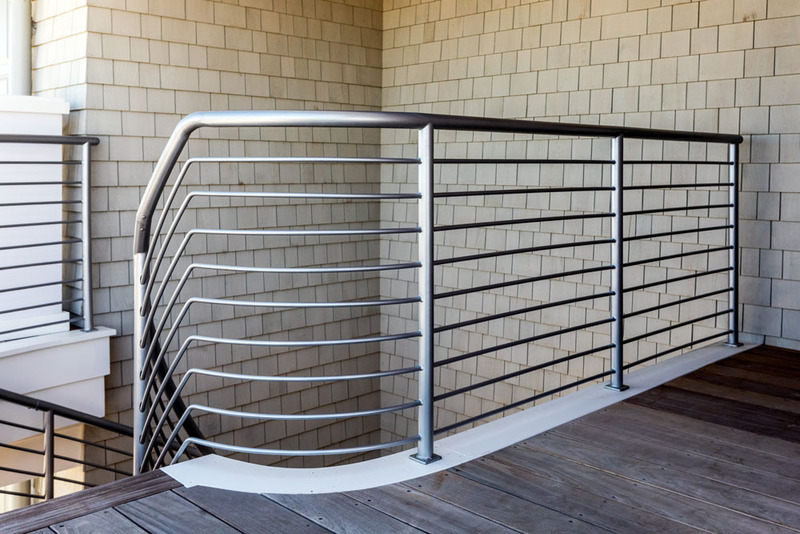 The entire stair railing structure, posts, handrail and horizontal rod material was created from stainless steel and powder-coated for the same modern silver effect. Because of the building progress while the months of stair revisions was taking place, getting the top stairs into position was a major hurdle. Not only was the stairs installed back from the front of deck, the stairs had to fit between the floors to get into position, the stairs then had to attach to the same floors that it had to clear to get in position. And there was an additional header restricting our clearances even further. 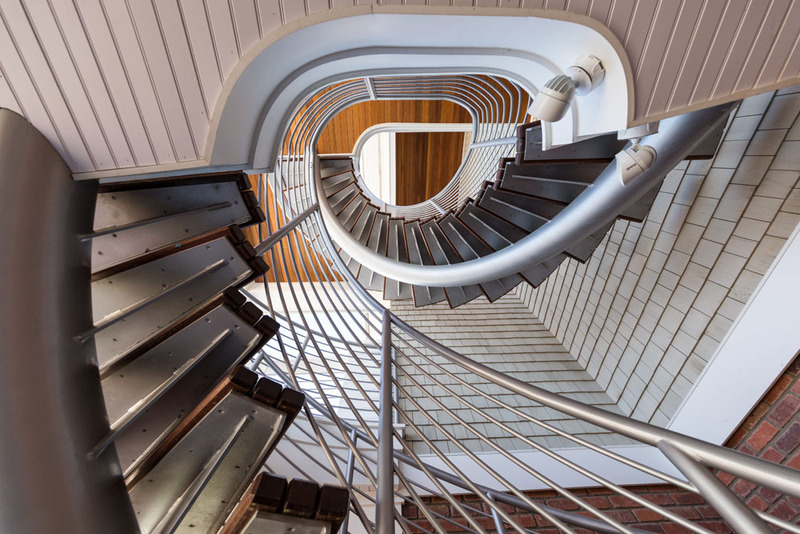 A special carrier was developed, which simplified it somewhat, but it still took multiple attempts and different angles and approaches to maneuver this curved modern stair into position. 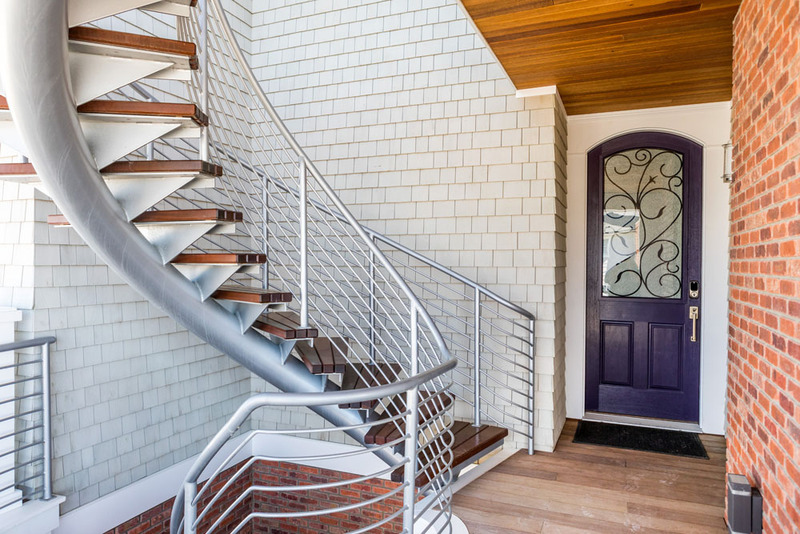 And with matching modern spiral staircase in the rear of the house, and matching horizontal terrace railing design on all floors of this beautiful shore home, vacationers and beach-goers have a beautiful, modern, sculptural staircase to utilize and appreciate for years to come. And with the correct pretreatment and finish, the stairs and railing will be an asset to this New Jersey Shore home.